In its early years High Life rented ski houses each winter. As the club membership increased, the need grew for a place of our own. 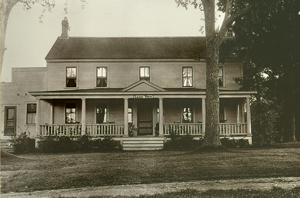 In October of 1972 the lodge was purchased for $32,000 and renovations began. The house at the time of purchase had stood vacant for a number of years, and required a complete overhaul of the plumbing, heating, and electrical systems. In order to use the lodge for the 1972 /1973 ski season, a number of members moved into the lodge to form a construction crew. By the time the ski season arrived, the lodge was ready for use; although a number of projects were still needed. The club began using it in late 1972, and has continued to expand and improve our home ever since. The first winter in the lodge must have been an experience. The second floor (as with many old New England homes) was heated by warm air rising through floor grates. That winter, a glass of water left overnight on the second floor would be frozen solid by morning. During the initial renovations, some of the work was prefabricated in New Jersey and hauled up to Vermont. Many of the beds in the house, and the first kitchen renovation were a result of members spending their evenings during the week preparing for projects to be brought to Vermont. There was a drive on the part of the club in the 1970’s to create something good to be passed along to future members. They have succeeded. In April 1988, the lodge was inspected under the new Vermont Fire Safety Code. A number of corrections were needed... Work started in April and continued through November. The lodge was the first building inspected under the new code, and the first structure to meet its requirement. Most of the work was done by members, and ironically the renovation cost $32,000; the same amount that we spent to purchase the house 18 years before. Since that long hot summer of 1988, continuous updates have produced improved baths and kitchen, plus big projects such as our bright red metal roof, new chimney and fireplace box, and new cedar siding. Grandest of all, the old barn aka garage / boathouse, has been remodeled and heated as a deluxe recreation center with a cold room, summer deck, a TV / reading loft with spiral staircase, pool room, and hardwood dance floor, and did we say 4 TV’s? Added to the barn in the summer of 2007 is a high definition projection TV for wall-size movies and sports. The main lodge and barn offer wireless internet access. A major kitchen renovation took place in the summer of 2009. History does not end with the present. As members, we have the opportunity to build on the past and to create a new legacy for future members.